The Crab Nebula (catalogue designations M1, NGC 1952, Taurus A) is a supernova remnant in the constellation of Taurus. The now-current name is due to William Parsons, who observed the object in 1840 using a 36-inch telescope and produced a drawing that looked somewhat like a crab. Corresponding to a bright supernova recorded by Chinese astronomers in 1054, the nebula was observed later by English astronomer John Bevis in 1731. The nebula was the first astronomical object identified with a historical supernova explosion. HaRGB image of the Crab Nebula from the Liverpool Telescope, exposures totalling 1.4 hours. Modern understanding that the Crab Nebula was created by a supernova traces back to 1921, when Carl Otto Lampland announced he had seen changes in its structure. This eventually led to the conclusion that the creation of the Crab Nebula corresponds to the bright SN 1054 supernova recorded by Chinese astronomers in AD 1054. There is a 13th-century Japanese reference to this "guest star" in Meigetsuki. The nebula is seen in the visible spectrum at 550 nm (green light). 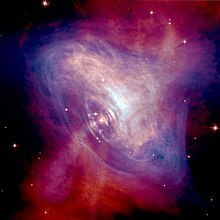 In the 1960s, because of the prediction and discovery of pulsars, the Crab Nebula again became a major center of interest. It was then that Franco Pacini predicted the existence of the Crab Pulsar for the first time, which would explain the brightness of the cloud. The star was observed shortly afterwards in 1968. The discovery of the Crab pulsar, and the knowledge of its exact age (almost to the day) allows for the verification of basic physical properties of these objects, such as characteristic age and spin-down luminosity, the orders of magnitude involved (notably the strength of the magnetic field), along with various aspects related to the dynamics of the remnant. The role of this supernova to the scientific understanding of supernova remnants was crucial, as no other historical supernova created a pulsar whose precise age is known for certain. The only possible exception to this rule would be SN 1181 whose supposed remnant, 3C 58, is home to a pulsar, but its identification using Chinese observations from 1181 is sometimes contested. In visible light, the Crab Nebula consists of a broadly oval-shaped mass of filaments, about 6 arcminutes long and 4 arcminutes wide (by comparison, the full moon is 30 arcminutes across) surrounding a diffuse blue central region. In three dimensions, the nebula is thought to be shaped either like an oblate spheroid (estimated as 1,380 pc/4,500 ly away) or a prolate spheroid (estimated as 2,020 pc/6,600 ly away). The filaments are the remnants of the progenitor star's atmosphere, and consist largely of ionised helium and hydrogen, along with carbon, oxygen, nitrogen, iron, neon and sulfur. The filaments' temperatures are typically between 11,000 and 18,000 K, and their densities are about 1,300 particles per cm3. Slow-motion movie of the Crab Pulsar, taken with OES Single-Photon-Camera. Very rarely, Saturn transits the Crab Nebula. Its transit in 2003 was the first since 1296; another will not occur until 2267. Researchers used the Chandra X-ray Observatory to observe Saturn's moon Titan as it crossed the nebula, and found that Titan's X-ray 'shadow' was larger than its solid surface, due to absorption of X-rays in its atmosphere. 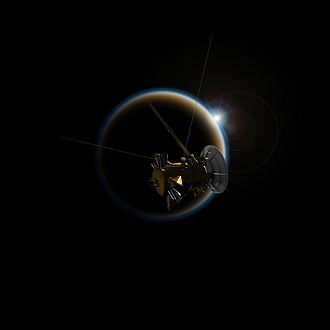 These observations showed that the thickness of Titan's atmosphere is 880 km (550 mi). The transit of Saturn itself could not be observed, because Chandra was passing through the Van Allen belts at the time. ^ a b c "M 1". SIMBAD. Centre de données astronomiques de Strasbourg. Retrieved 12 February 2012. ^ Kaplan, David L.; Chatterjee, S.; Gaensler, B. M.; Anderson, J. (2008). "A Precise Proper Motion for the Crab Pulsar, and the Difficulty of Testing Spin-Kick Alignment for Young Neutron Stars". The Astrophysical Journal. 677 (2): 1201–1215. arXiv:0801.1142. Bibcode:2008ApJ...677.1201K. doi:10.1086/529026. ^ a b c d Trimble, Virginia Louise (1973). "The Distance to the Crab Nebula and NP 0532". Publications of the Astronomical Society of the Pacific. 85 (507): 579–585. Bibcode:1973PASP...85..579T. doi:10.1086/129507. JSTOR 40675440. ^ a b Hester, J. J. (2008). "The Crab Nebula: An Astrophysical Chimera". Annual Review of Astronomy and Astrophysics. 46: 127–155. Bibcode:2008ARA&A..46..127H. doi:10.1146/annurev.astro.45.051806.110608. ^ Parsons, William (1844). "Observations on Some of the Nebulae". Philosophical Transactions of the Royal Society of London. 134. fig. 81, plate xviii, p. 321. doi:10.1098/rstl.1844.0012. JSTOR 108366. ^ "Crab Nebula: The Spirit of Halloween Lives on as a Dead Star Creates Celestial Havoc". Chandra X-ray Observatory. Harvard University. 24 October 2006. Retrieved 11 February 2012. The neutron star, which has the mass equivalent to the sun crammed into a rapidly spinning ball of neutrons twelve miles across, is the bright white dot in the center of the image. ^ "Pulsar Wind Nebulae". 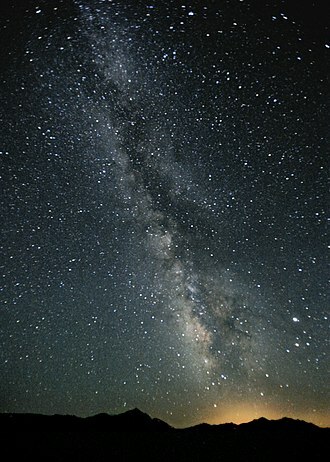 Smithsonian Astrophysical Observatory. 4 November 2016. Retrieved 26 March 2017. ^ a b Lampland, C. O. (1921). "Observed Changes in the Structure of the "Crab" Nebula (N. G. C. 1952)". Publications of the Astronomical Society of the Pacific. 33 (192): 79–84. Bibcode:1921PASP...33...79L. doi:10.1086/123039. JSTOR 40710638. ^ Katgert-Merkelijn, J.; Damen, J. (2000). 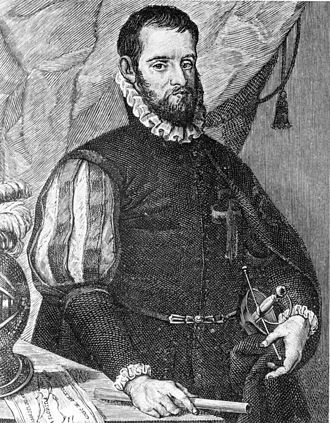 "A short biography of Jan Hendrik Oort: 7. Crab Nebula". Leiden University Library. Archived from the original on 4 September 2014. Retrieved 9 March 2015. ^ Usui, Tadashi (11 January 2007). "Why and how did a Japanese poet record the Supernova of AD 1054?". Archived from the original on 3 March 2016. Retrieved 4 March 2015. ^ Fujiwara no Sadaie (c. 1200). Meigetsuki [Record of the Clear Moon]. ^ Gingerich, Owen (April 1986). "Islamic astronomy" (PDF). Scientific American. 254 (10): 74. Bibcode:1986SciAm.254d..74G. doi:10.1038/scientificamerican0486-74. ^ Ibn Abi Usaibia (1971) [1245–1246]. "Chapter 10: On the Classes of Physicians of Iraq, al-Jazirah and Diyar Bekr". Lives of the Physicians. Kopf, Lothar (trans.). ^ a b Green, David A.; Stephenson, F. Richard (2003). Weiler, K. W., ed. The Historical Supernovae. Supernovae and Gamma Ray Bursters. Lecture Notes in Physics. 598. Berlin: Springer. pp. 7–19. arXiv:astro-ph/0301603. Bibcode:2003LNP...598....7G. doi:10.1007/3-540-45863-8_2. ISBN 978-3-540-44053-6. ^ a b c Barrow, John D. (2008). Cosmic Imagery: Key Images in the History of Science. Random House. p. 45. ISBN 978-0-224-07523-7. ^ a b Pugh, Philip (November 2011). Observing the Messier Objects with a Small Telescope: In the Footsteps of a Great Observer. Springer Science. pp. 8–10. ISBN 978-0-387-85357-4. ^ a b c Mayall, Nicholas Ulrich (1939). "The Crab Nebula, a Probable Supernova". Astronomical Society of the Pacific Leaflets. 3 (119): 145. Bibcode:1939ASPL....3..145M. ^ Jones, Kenneth Glyn (1975). The Search for the Nebulae. Alpha Academic. ^ Rossi, Bruno Benedetto (1970). "The Crab Nebula. Ancient History and Recent Discoveries". In Conversi, M. Evolution of Particle Physics. Academic Press. p. 237. ^ a b Lundmark, Knut (1921). "Suspected New Stars Recorded in Old Chronicles and Among Recent Meridian Observations". Publications of the Astronomical Society of the Pacific. 33 (195): 225–238. Bibcode:1921PASP...33..225L. doi:10.1086/123101. JSTOR 40668518. ^ Duncan, John Charles (1921). "Changes Observed in the Crab Nebula in Taurus". Proceedings of the National Academy of Sciences. 7 (6): 179–181. Bibcode:1921PNAS....7..179D. doi:10.1073/pnas.7.6.179. PMC 1084821. PMID 16586833. ^ Srinivasan, G. (1997). "Neutron Stars". 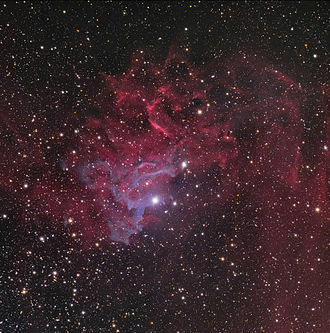 Stellar Remnants. Lecture Notes 1995, Swiss Society for Astrophysics and Astronomy. Springer Science. p. 108. ISBN 978-3-540-61520-0. ^ Collins, George W., II; Claspy, William P.; Martin, John C. (1999). "A Reinterpretation of Historical References to the Supernova of A.D. 1054". Publications of the Astronomical Society of the Pacific. 111 (761): 871–880. arXiv:astro-ph/9904285. Bibcode:1999PASP..111..871C. doi:10.1086/316401. ^ Setti, Giancarlo (2012). "Franco Pacini (1939–2012)". Bulletin of the American Astronomical Society. 44: 011. doi:10.3847/BAASOBIT2012011 (inactive 2019-03-11). ^ Bietenholz, M. F. (July 2006). "Radio Images of 3C 58: Expansion and Motion of Its Wisp" (PDF). The Astrophysical Journal. 645 (2): 1180–1187. arXiv:astro-ph/0603197. Bibcode:2006ApJ...645.1180B. doi:10.1086/504584. ^ Fesen, R. A.; Kirshner, R. P. (1982). "The Crab Nebula. I – Spectrophotometry of the filaments". The Astrophysical Journal. 258 (1): 1–10. Bibcode:1982ApJ...258....1F. doi:10.1086/160043. ^ Shklovskii, Iosif (1953). "On the Nature of the Crab Nebula's Optical Emission". Doklady Akademii Nauk SSSR. 90: 983. Bibcode:1957SvA.....1..690S. ^ Burn, B. J. (1973). "A synchrotron model for the continuum spectrum of the Crab Nebula". Monthly Notices of the Royal Astronomical Society. 165 (4): 421–429. Bibcode:1973MNRAS.165..421B. doi:10.1093/mnras/165.4.421. ^ Bietenholz, M. F.; Kronberg, P. P.; Hogg, D. E.; Wilson, A. S. (1991). "The expansion of the Crab Nebula". The Astrophysical Journal Letters. 373: L59–L62. Bibcode:1991ApJ...373L..59B. doi:10.1086/186051. ^ Nemiroff, R.; Bonnell, J., eds. (27 December 2001). "Animation showing expansion from 1973 to 2001". Astronomy Picture of the Day. NASA. Retrieved 10 March 2010. ^ Trimble, Virginia Louise (1968). "Motions and Structure of the Filamentary Envelope of the Crab Nebula" (PDF). Astronomical Journal. 73: 535. Bibcode:1968AJ.....73..535T. doi:10.1086/110658. ^ Bejger, M.; Haensel, P. (2003). "Accelerated expansion of the Crab Nebula and evaluation of its neutron-star parameters". Astronomy and Astrophysics. 405 (2): 747–751. arXiv:astro-ph/0301071. Bibcode:2003A&A...405..747B. doi:10.1051/0004-6361:20030642. ^ "Crab Nebula exploded in 1054". Astronomy.com. 8 June 2007. Retrieved 10 September 2014. ^ Green, D. A.; Tuffs, R. J.; Popescu, C. C. (2004). "Far-infrared and submillimetre observations of the Crab nebula". Monthly Notices of the Royal Astronomical Society. 355 (4): 1315–1326. arXiv:astro-ph/0409469. Bibcode:2004MNRAS.355.1315G. doi:10.1111/j.1365-2966.2004.08414.x. ^ a b Fesen, Robert A.; Shull, J. Michael; Hurford, Alan P. (1997). "An Optical Study of the Circumstellar Environment Around the Crab Nebula". The Astronomical Journal. 113: 354–363. Bibcode:1997AJ....113..354F. doi:10.1086/118258. ^ a b MacAlpine, Gordon M.; Ecklund, Tait C.; Lester, William R.; Vanderveer, Steven J.; Strolger, Louis-Gregory (2007). "A Spectroscopic Study of Nuclear Processing and the Production of Anomalously Strong Lines in the Crab Nebula". The Astronomical Journal. 133 (1): 81–88. arXiv:astro-ph/0609803. Bibcode:2007AJ....133...81M. doi:10.1086/509504. ^ Minkowski, Rudolph (September 1942). "The Crab Nebula". The Astrophysical Journal. 96: 199. Bibcode:1942ApJ....96..199M. doi:10.1086/144447. ^ Bolton, John G.; Stanley, G. J.; Slee, O. B. (1949). "Positions of three discrete sources of Galactic radio frequency radiation". Nature. 164 (4159): 101–102. Bibcode:1949Natur.164..101B. doi:10.1038/164101b0. ^ a b Bowyer, S.; Byram, E. T.; Chubb, T. A.; Friedman, H. (1964). "Lunar Occultation of X-ray Emission from the Crab Nebula". Science. 146 (3646): 912–917. Bibcode:1964Sci...146..912B. doi:10.1126/science.146.3646.912. PMID 17777056. ^ Haymes, R. C.; Ellis, D. V.; Fishman, G. J.; Kurfess, J. D.; Tucker, W. H. (1968). "Observation of Gamma Radiation from the Crab Nebula". The Astrophysical Journal Letters. 151: L9. Bibcode:1968ApJ...151L...9H. doi:10.1086/180129. ^ Del Puerto, C. (2005). "Pulsars In The Headlines". EAS Publications. 16: 115–119. Bibcode:2005EAS....16..115D. doi:10.1051/eas:2005070. ^ LaViolette, Paul A. (April 2006). Decoding the Message of the Pulsars: Intelligent Communication from the Galaxy. Bear & Co. p. 73. ISBN 978-1-59143-062-9. ^ LaViolette, Paul A. (April 2006). Decoding the Message of the Pulsars: Intelligent Communication from the Galaxy. Bear & Co. p. 135. ISBN 978-1-59143-062-9. ^ Bejger, M.; Haensel, P. (2002). "Moments of inertia for neutron and strange stars: Limits derived for the Crab pulsar". Astronomy and Astrophysics. 396 (3): 917–921. arXiv:astro-ph/0209151. Bibcode:2002A&A...396..917B. doi:10.1051/0004-6361:20021241. ^ Harnden, F. R.; Seward, F. D. (1984). "Einstein observations of the Crab nebula pulsar". The Astrophysical Journal. 283: 279–285. Bibcode:1984ApJ...283..279H. doi:10.1086/162304. ^ Kaufmann, W. J. (1996). Universe (4th ed.). W. H. Freeman. p. 428. ISBN 978-0-7167-2379-0. ^ a b Hester, J. Jeff; Scowen, P. A.; Sankrit, R.; Michel, F. C.; et al. (1996). "The Extremely Dynamic Structure of the Inner Crab Nebula". Bulletin of the American Astronomical Society. 28 (2): 950. Bibcode:1996BAAS...28..950H. ^ Maoz, Dan (December 2011). Astrophysics in a Nutshell. Princeton University Press. p. 90. ISBN 978-1-4008-3934-6. ^ Pasachoff, Jay M.; Filippenko, Alex (August 2013). The Cosmos: Astronomy in the New Millennium. Cambridge University Press. p. 357. ISBN 978-1-107-27695-6. ^ Nomoto, K. (1985). "Evolutionary models of the Crab Nebula's progenitor". The Crab Nebula and related supernova remnants; Proceedings of the Workshop. The Crab Nebula and Related Supernova Remnants. Cambridge University Press. pp. 97–113. Bibcode:1985cnrs.work...97N. ^ a b Davidson, K.; Fesen, R. A. (1985). "Recent developments concerning the Crab Nebula". Annual Review of Astronomy and Astrophysics. 23 (507): 119–146. Bibcode:1985ARA&A..23..119D. doi:10.1146/annurev.aa.23.090185.001003. ^ Tominaga, N.; Blinnikov, S. I.; Nomoto, Ken'Ichi (2013). "Supernova explosions of super-asymptotic giant branch stars: multicolor light curves of electron-capture supernovae". The Astrophysical Journal Letters. 771 (1): L12. arXiv:1305.6813. Bibcode:2013ApJ...771L..12T. doi:10.1088/2041-8205/771/1/L12. ^ Frail, D. A.; Kassim, N. E.; Cornwell, T. J.; Goss, W. M. (1995). "Does the Crab Have a Shell?". The Astrophysical Journal Letters. 454 (2): L129–L132. arXiv:astro-ph/9509135. Bibcode:1995ApJ...454L.129F. doi:10.1086/309794. ^ Palmieri, T. M.; Seward, F. D.; Toor, A.; van Flandern, T. C. (1975). "Spatial distribution of X-rays in the Crab Nebula". The Astrophysical Journal. 202: 494–497. Bibcode:1975ApJ...202..494P. doi:10.1086/153998. ^ Erickson, W. C. (1964). "The Radio-Wave Scattering Properties of the Solar Corona". The Astrophysical Journal. 139: 1290. Bibcode:1964ApJ...139.1290E. doi:10.1086/147865. ^ Mori, K.; Tsunemi, H.; Katayama, H.; Burrows, D. N.; Garmire, G. P.; Metzger, A. E. (2004). "An X-Ray Measurement of Titan's Atmospheric Extent from Its Transit of the Crab Nebula". The Astrophysical Journal. 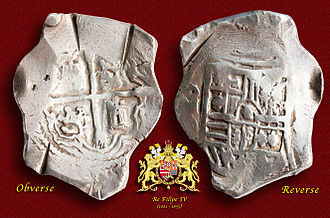 607 (2): 1065–1069. arXiv:astro-ph/0403283. Bibcode:2004ApJ...607.1065M. doi:10.1086/383521. Chandra images used by Mori et al. can be viewed here. ^ van den Bergh, Sidney (1970). "A Jetlike Structure Associated with the Crab Nebula". The Astrophysical Journal Letters. 160: L27. Bibcode:1970ApJ...160L..27V. doi:10.1086/180516. Carl Otto Lampland was an American astronomer. 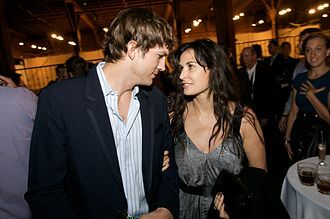 He was born into a family of ten children, both his father Ole Helliksen Lampland and his mother Berit Gulliksdatter Skartum were born in Norway. He was educated first at Valparaiso Normal school in Valparaiso, Indiana and he studied at Indiana University, where he received a B. A. degree in astronomy in 1902, an M. A. in 1906, and an honorary LL. D in 1930. He first went to Lowell Observatory in 1902 when invited by Percival Lowell and he designed cameras used for astronomy and designed and maintained telescopes, including resilvering the mirror of the 40-inch telescope. He constructed thermocouples and used them to temperatures of planets. 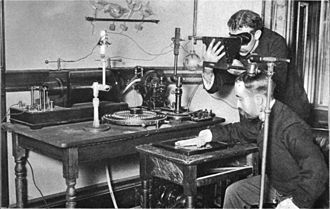 He won the Royal Photographic Society Medal in 1905 for the camera which he designed for the 24-inch Clark telescope, together with William Coblentz, he measured large differences between the day and night temperatures on Mars which implied a thin Martian atmosphere. He discovered the asteroid 1604 Tombaugh, in 1907 Lampland and Lowell won a Royal Photographic Society exhibition medal for their photographs of Mars. A corona is an aura of plasma that surrounds the sun and other stars. The Suns corona extends millions of kilometres into space and is most easily seen during a solar eclipse. The word corona is a Latin word meaning crown, from the Ancient Greek κορώνη, the high temperature of the Suns corona gives it unusual spectral features, which led some in the 19th century to suggest that it contained a previously unknown element, coronium. Instead, these features have since been explained by highly ionized iron. Bengt Edlén, following the work of Grotrian, first identified the coronal spectral lines in 1940 as transitions from low-lying metastable levels of the configuration of highly ionised metals. These high stages of ionisation indicate a temperature in excess of 1,000,000 kelvins. Light from the corona comes from three sources, from the same volume of space. The suns corona is much hotter than the surface of the Sun. The corona is 10−12 times as dense as the photosphere, the corona is separated from the photosphere by the relatively shallow chromosphere. The exact mechanism by which the corona is heated is still the subject of some debate, the outer edges of the Suns corona are constantly being transported away due to open magnetic flux and hence generating the solar wind. The corona is not always evenly distributed across the surface of the sun, during periods of quiet, the corona is more or less confined to the equatorial regions, with coronal holes covering the polar regions. However, during the Suns active periods, the corona is evenly distributed over the equatorial and polar regions, the solar cycle spans approximately 11 years, from solar minimum to the following minimum. 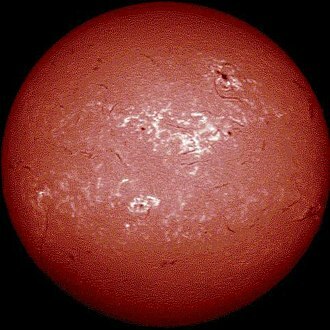 Associated with sunspots are coronal loops, loops of magnetic flux, the magnetic flux pushes the hotter photosphere aside, exposing the cooler plasma below, thus creating the relatively dark sun spots. The astronomers usually distinguish several regions, as described below, active regions are ensembles of loop structures connecting points of opposite magnetic polarity in the photosphere, the so-called coronal loops. Edmond Halley, FRS was an English astronomer, mathematician and physicist who is best known for computing the orbit of Halleys Comet. He was the second Astronomer Royal in Britain, succeeding John Flamsteed, Halley was born in Haggerston, in east London. His father, Edmond Halley Sr. came from a Derbyshire family and was a wealthy soap-maker in London, as a child, Halley was very interested in mathematics. 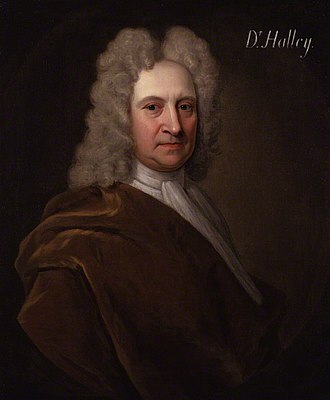 He studied at St Pauls School, and from 1673 at The Queens College, while still an undergraduate, Halley published papers on the Solar System and sunspots. While at Oxford University, Halley was introduced to John Flamsteed, influenced by Flamsteeds project to compile a catalog of northern stars, Halley proposed to do the same for the Southern Hemisphere. In 1676, Halley visited the south Atlantic island of Saint Helena, while there he observed a transit of Mercury, and realised that a similar transit of Venus could be used to determine the absolute size of the Solar System. He returned to England in May 1678, in the following year he went to Danzig on behalf of the Royal Society to help resolve a dispute. Because astronomer Johannes Hevelius did not use a telescope, his observations had been questioned by Robert Hooke, Halley stayed with Hevelius and he observed and verified the quality of Hevelius observations. 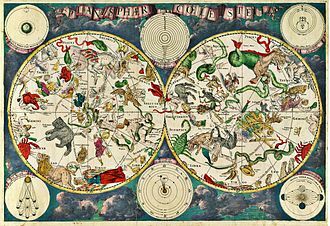 In 1679, Halley published the results from his observations on St. Helena as Catalogus Stellarum Australium which included details of 341 southern stars and these additions to contemporary star maps earned him comparison with Tycho Brahe, e. g. the southern Tycho as described by Flamsteed. Halley was awarded his M. A. degree at Oxford, in 1686, Halley published the second part of the results from his Helenian expedition, being a paper and chart on trade winds and monsoons. The symbols he used to represent trailing winds still exist in most modern day weather chart representations, in this article he identified solar heating as the cause of atmospheric motions. He established the relationship between pressure and height above sea level. His charts were an important contribution to the field of information visualisation. The speed of light in vacuum, commonly denoted c, is a universal physical constant important in many areas of physics. Its exact value is 299792458 metres per second, it is exact because the unit of length, the metre, is defined from this constant, according to special relativity, c is the maximum speed at which all matter and hence information in the universe can travel. It is the speed at which all particles and changes of the associated fields travel in vacuum. Such particles and waves travel at c regardless of the motion of the source or the reference frame of the observer. In the theory of relativity, c interrelates space and time, the speed at which light propagates through transparent materials, such as glass or air, is less than c, the speed of radio waves in wire cables is slower than c. The ratio between c and the speed v at which light travels in a material is called the index n of the material. In communicating with distant space probes, it can take minutes to hours for a message to get from Earth to the spacecraft, the light seen from stars left them many years ago, allowing the study of the history of the universe by looking at distant objects. The finite speed of light limits the theoretical maximum speed of computers. The speed of light can be used time of flight measurements to measure large distances to high precision. Ole Rømer first demonstrated in 1676 that light travels at a speed by studying the apparent motion of Jupiters moon Io. In 1865, James Clerk Maxwell proposed that light was an electromagnetic wave, in 1905, Albert Einstein postulated that the speed of light c with respect to any inertial frame is a constant and is independent of the motion of the light source. He explored the consequences of that postulate by deriving the theory of relativity and in doing so showed that the parameter c had relevance outside of the context of light and electromagnetism. After centuries of increasingly precise measurements, in 1975 the speed of light was known to be 299792458 m/s with a measurement uncertainty of 4 parts per billion. In 1983, the metre was redefined in the International System of Units as the distance travelled by light in vacuum in 1/299792458 of a second, as a result, the numerical value of c in metres per second is now fixed exactly by the definition of the metre. The parsec is a unit of length used to measure large distances to objects outside the Solar System. One parsec is the distance at which one astronomical unit subtends an angle of one arcsecond, a parsec is equal to about 3.26 light-years in length. The nearest star, Proxima Centauri, is about 1.3 parsecs from the Sun, most of the stars visible to the unaided eye in the nighttime sky are within 500 parsecs of the Sun. 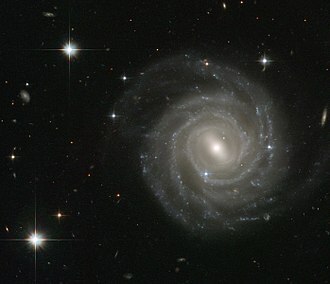 The parsec unit was likely first suggested in 1913 by the British astronomer Herbert Hall Turner, named from an abbreviation of the parallax of one arcsecond, it was defined so as to make calculations of astronomical distances quick and easy for astronomers from only their raw observational data. Partly for this reason, it is still the unit preferred in astronomy and astrophysics, though the light-year remains prominent in science texts. This corresponds to the definition of the parsec found in many contemporary astronomical references. Derivation, create a triangle with one leg being from the Earth to the Sun. As that point in space away, the angle between the Sun and Earth decreases. A parsec is the length of that leg when the angle between the Sun and Earth is one arc-second. One of the oldest methods used by astronomers to calculate the distance to a star is to record the difference in angle between two measurements of the position of the star in the sky. The first measurement is taken from the Earth on one side of the Sun, and the second is approximately half a year later. The distance between the two positions of the Earth when the two measurements were taken is twice the distance between the Earth and the Sun. The difference in angle between the two measurements is twice the angle, which is formed by lines from the Sun. Then the distance to the star could be calculated using trigonometry. 5-parsec distance of 61 Cygni, the parallax of a star is defined as half of the angular distance that a star appears to move relative to the celestial sphere as Earth orbits the Sun. Equivalently, it is the angle, from that stars perspective. SN1054 is a supernova that was first observed on 4 July 1054, and remained visible for around two years. The event was recorded in contemporary Chinese astronomy, and references to it are found in a Japanese document. The remnant of SN1054, which consists of debris ejected during the explosion, is known as the Crab Nebula and it is located in the sky near the star Zeta Tauri. The core of the star formed a pulsar, called the Crab Pulsar. The nebula and the pulsar that it contains are some of the most studied astronomical objects outside the Solar System and it is one of the few Galactic supernovae where the date of the explosion is well known. The two objects are the most luminous in their respective categories, for these reasons, and because of the important role it has repeatedly played in the modern era, SN1054 is the best known supernova in the history of astronomy. 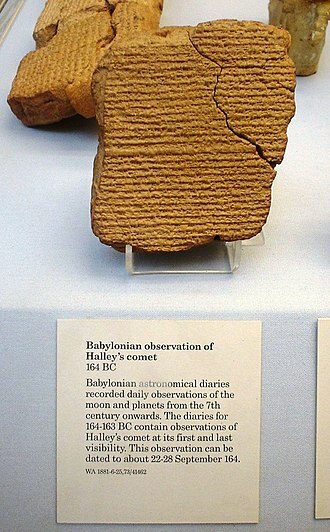 When the French astronomer Charles Messier watched for the return of Halleys Comet in 1758, he confused the nebula for the comet, due to this error, he created his catalogue of non-cometary nebulous objects, the Messier Catalogue, to avoid such mistakes in the future. The nebula is catalogued as the first Messier object, or M1, the Crab Nebula was identified as the supernova remnant of SN1054 between 1921 and 1942, at first speculatively, with some plausibility by 1939, and beyond reasonable doubt by Jan Oort in 1942. In 1921, Carl Otto Lampland was the first to announce that he had changes in the structure of the Crab Nebula. This announcement occurred at a time when the nature of the nebulas in the sky was completely unknown and their nature and distance were subject to debate. Lamplands comments were confirmed some weeks by John Charles Duncan, the points were moving away from the centre, and did so faster as they got further from it. Also in 1921, Knut Lundmark compiled the data for the guest stars mentioned in the Chinese chronicles known in the West. Lundmark gives a list of 60 suspected novae, the term for a stellar explosion. The nova of 1054, already mentioned by the Biots in 1843, is part of the list. In 1928, Edwin Hubble was the first to note that the aspect of the Crab Nebula. A supernova remnant is the structure resulting from the explosion of a star in a supernova. The supernova remnant is bounded by a shock wave, and consists of ejected material expanding from the explosion. In either case, the supernova explosion expels much or all of the stellar material with velocities as much as 10% the speed of light. These ejecta are highly supersonic, assuming a typical temperature of the medium of 10,000 K. Therefore, a shock wave forms ahead of the ejecta. One of the best observed young supernova remnants was formed by SN 1987A, the youngest known remnant in our galaxy is G1. 9+0.3, discovered in the galactic center. An SNR passes through the stages as it expands, Free expansion of the ejecta. This can last tens to a few hundred years depending on the density of the surrounding gas, sweeping up of a shell of shocked circumstellar and interstellar gas. This begins the Sedov-Taylor phase, which can be modeled by a self-similar analytic solution. Strong X-ray emission traces the strong waves and hot shocked gas. Fujiwara Sadaie, better-known as Fujiwara no Teika, was a Japanese poet, calligrapher, anthologist and scholar of the late Heian and early Kamakura periods. Teikas critical ideas on composing poetry were influential and studied until as late as the Meiji era. A member of a clan, Teika was born to the noted poet Fujiwara no Shunzei. After coming to the attention of the Retired Emperor Go-Toba, Teika began his long and distinguished career and his relationship with Go-Toba was at first cordial and led to commissions to compile anthologies, but resulted in his banishment from the retired emperors court. His descendants and ideas would dominate classical Japanese poetry for centuries afterwards and his branch of the clan sought prestige and power in the court by aligning itself with the Mikohidari family, and by specializing in artistic endeavors, principally poetry. Teikas grandfather was the venerable poet Fujiwara no Toshitada and his father was Fujiwara no Shunzei, a well known and greatly respected poet, who had compiled the seventh Imperial anthology of waka. His sister would become a well-respected poet of waka and renga, known as Kengozen or Shunzeis Daughter. His elder brother, Fujiwara no Nariee, would be successful in court. Teikas foster-brother, the priest Jakuren or Sadanaga c, 1139–1202 would be successful as a poet although his career was cut tragically short, he had been adopted by Shunzei when Shunzeis younger brother retired from the world. Teikas goals as the male of his branch were to inherit and cement his fathers position in poetry. The Retired Emperor Go-Toba announced, in the year of his abdication that he would be conducting a poetry contest. Go-Toba regarded all these pursuits as hobbies, taking one up, one of these was his support of poetry, especially the waka. The first contest was considered a crucial political nexus, if a clans poet did well and impressed the powerful Go-Toba, Teikas diary records that he looked forward to this chance to improve himself. He was 38, and had reached middle age, while he was recognized as a talented poet, his career was stagnant, he had been in the Palace Guards of the Left for twenty years, and had not been promoted for nearly 10. The Hubble Space Telescope is a space telescope that was launched into low Earth orbit in 1990 and remains in operation. Although not the first space telescope, Hubble is one of the largest and most versatile, with a 2. 4-meter mirror, Hubbles four main instruments observe in the near ultraviolet and near infrared spectra. Hubbles orbit outside the distortion of Earths atmosphere allows it to take extremely high-resolution images, Hubble has recorded some of the most detailed visible light images ever, allowing a deep view into space and time. Many Hubble observations have led to breakthroughs in astrophysics, such as determining the rate of expansion of the universe. The HST was built by the United States space agency NASA, the Space Telescope Science Institute selects Hubbles targets and processes the resulting data, while the Goddard Space Flight Center controls the spacecraft. Space telescopes were proposed as early as 1923, Hubble was funded in the 1970s, with a proposed launch in 1983, but the project was beset by technical delays, budget problems, and the Challenger disaster. When finally launched in 1990, Hubbles main mirror was found to have been ground incorrectly, the optics were corrected to their intended quality by a servicing mission in 1993. 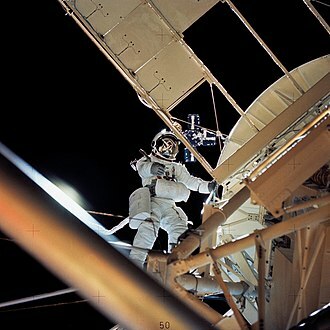 Hubble is the telescope designed to be serviced in space by astronauts. After launch by Space Shuttle Discovery in 1990, five subsequent Space Shuttle missions repaired, the fifth mission was canceled on safety grounds following the Columbia disaster. However, after spirited public discussion, NASA administrator Mike Griffin approved the fifth servicing mission, the telescope is operating as of 2017, and could last until 2030–2040. Its scientific successor, the James Webb Space Telescope, is scheduled for launch in 2018, the history of the Hubble Space Telescope can be traced back as far as 1946, to the astronomer Lyman Spitzers paper Astronomical advantages of an extraterrestrial observatory. In it, he discussed the two advantages that a space-based observatory would have over ground-based telescopes. First, the resolution would be limited only by diffraction, rather than by the turbulence in the atmosphere. 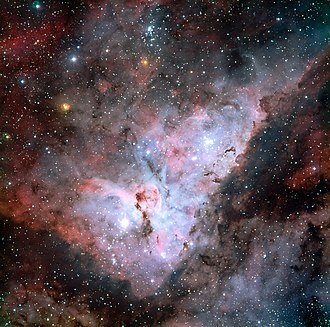 Picture of small section of the Carina Nebula created from images taken with Hubble's Wide Field Planetary Camera 2. The largest telescope of the 19th century, the Leviathan of Parsonstown. PSR B1509-58 – X-rays from Chandra are gold; Infrared from WISE in red, green and blue/max. The Vela Pulsar and its surrounding pulsar wind nebula. The Moon as seen by the Compton Gamma Ray Observatory, in gamma rays of greater than 20 MeV. These are produced by cosmic ray bombardment of its surface. 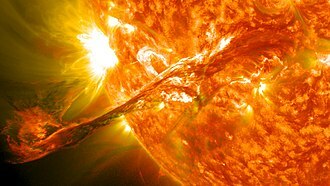 The Sun, which has no similar surface of high atomic number to act as target for cosmic rays, cannot usually be seen at all at these energies, which are too high to emerge from primary nuclear reactions, such as solar nuclear fusion (though occasionally the Sun produces gamma rays by cyclotron-type mechanisms, during solar flares). Gamma rays typically have higher energy than X-rays. SN 1054 remnant (Crab Nebula). The guest star reported by Chinese astronomers in 1054 is identified as SN 1054. The highlighted passages refer to the supernova. Henry before Tivoli pointing up at a new star. Wide view of the Crab Nebula. 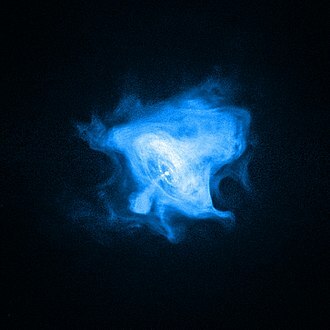 X-ray picture of Crab Nebula, taken by Chandra. Four different planetary nebulae. Clockwise starting from the top left: NGC 6543, NGC 7662, NGC 6826, and NGC 7009. Ibn Butlan's Tacuinum sanitatis, Rhineland, 2nd half of 15th century.